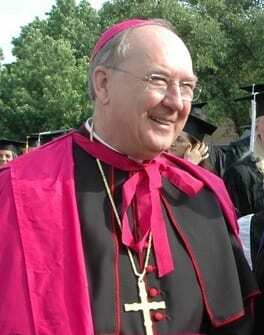 The Pope has nominated Cardinal Jerin [Kevin] Joseph Farrell, Prefect of the Dicastery for the Laity, the Family and Life, as the Camerlengo of the Holy Roman Church. The camerlengo is responsible for the formal determination of the death of the reigning pope; the traditional procedure – abandoned centuries ago – was to call his baptismal name (e.g. “Albine, dormisne?”, meaning “[name], are you sleeping?”). After the pope is declared dead, the camerlengo takes possession of the Ring of the Fisherman and cuts it with shears in the presence of the cardinals. This act symbolizes the end of the late Pope’s authority and prevents its use in forging documents. The camerlengo then notifies the appropriate officers of the Roman Curia and the dean of the College of Cardinals. He participates in the preparations for the conclave and the pope’s funeral. In the past the camerlengo took possession of the pope’s last will and took responsibility for revealing its contents. Now the last will of the pope is given to the College of Cardinals and its content is revealed during the first meeting of the College of Cardinals. The only responsibility still in the camerlengo’s hands is to safekeep the last will of the pope until the College of Cardinals takes possession of it.